Yes, I realize I am late with this post. If I had been home last week (instead of hitting the slopes in Sun Valley), I would have made this on, say, Wednesday and posted about it in time for you to make it for the Superbowl. But let me ask this – how did chili become the Superbowl dish par excellence? And if the chili is really good, shouldn’t we eat it post-Superbowl and while it is still winter? Here is the thing about vegetarian chili. It’s just so obvious. This is a food blog written by a vegetarian – of course there is a vegetarian chili recipe, right? Well, I’ve been writing this blog for over a year and a half without ever talking about it. I have nothing against vegetarian chili, actually I quite like it, but to me it’s like having all my recipes feature eggplant and mushrooms because they are “meaty”. Chili, even if it does not contain meat, is “meaty” which is why some carnivores think we vegetarians eat nothing other than chili, eggplant, mushrooms, and salad. And pasta. Sheesh. I have made my fair share of vegetarian chilis. Some have been good and some have not. I have followed recipes that instructed me to use many different kinds of beans and one that used just kidney beans (which made me realize that I don’t like kidney beans). I’ve added bulghur, tempeh, and TVP and didn’t like any of those additions. My go-to recipe became the one in The New Basics but over time I decided that the chili just ended up being too busy. The list of ingredients is a bit long and, for me, the flavor gets muddied. Last week, after a day on the slopes in the sunshine (sorry), my lunch of choice was a baked potato with vegetarian chili poured over the top of it. Does that sound weird? It’s not for two reasons. One, if you have never had an Idaho potato in Idaho, it is worth the trip just to eat one. They are huge and they are tasty and those Idahoans know how to bake them perfectly. Two, I know people who eat chili over rice and given the choice between those two starches, I’m suggesting you pick a potato. The chili in those beautiful mountain lodges was not half bad. The faults were as follows: too salty, too soupy, and not enough spice. I knew that as soon as I got home I had to make a pot and make up the recipe myself. I decided to keep what I liked about that Sun Valley chili (corn, chickpeas, very tomato-y broth) and improvise the rest. I’m very happy with how my post-Superbowl but still winter chili came out. Most chilis aren’t smoky enough for me, so I worked hard to get that flavor into mine. We like spice in our house so my version was quite spicy, you can make yours more mild easily. Chipotle peppers in adobo sauce are found in the Mexican foods section of your grocery store. They are an intoxicatingly smoky (and spicy) little pepper best used with caution of you are sensitive to heat. For last night’s verison, I used two of them plus about a teaspoon of the sauce and next time I will only use one (which I have instructed you to do below). Once you have opened the can, you can put the remaining peppers and sauce into an airtight container in the refrigerator where it will keep for a month or more. My rule of thumb for chili is that all the vegetables be no larger than the beans. I don’t like big chunks in my chili. I used crushed tomatoes here for that reason but feel free to use diced (or even whole) if you like chunks. 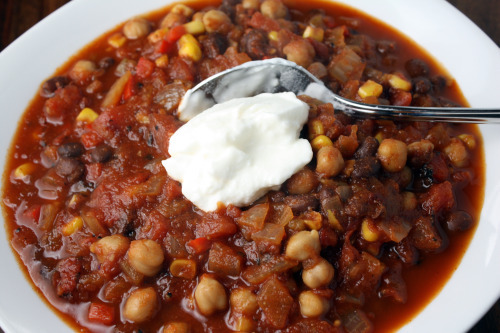 I like my chili served with a dollop of plain yogurt but feel free to add any and all topping that you like. Place a large pot over medium heat and then drizzle in enough olive oil to coat the bottom. Add the onion and cook until softened, stirring frequently, about 5 minutes. Add the garlic and cook for another 3 minutes. Stir in all the spices and stir well to coat the vegetables with the spices. Drop in the red pepper and cook for 3 minutes. Pour in the canned tomatoes and water and bring to a boil. Add the chipotle pepper and sauce and turn the heat down to a simmer. Add all the beans, corn, and the green chiles and cook at a simmer, partially covered, until thickened and all the vegetables are cooked through – about 20 minutes. Like most soups and stews, this can be made in advance and its flavors will deepen. It will also become more spicy so, if you are making it in advance, you might want to add just a bit of heat while you are cooking it and add more when you re-heat if necessary. Oh wow this chili looks perfect! yum! I love love love a good veggie chili and I appreciate your rule regarding the size of the vegetables, point taken. Glad you all enjoyed your trip! I read somewhere once, what does your chili say about you? I liked that. My roommate during my sophomore year of college used to always make chili for her boyfriend. I asked her for her recipe and she said that you really don’t need one. That was the beginning of my chili making days, which started with just 5 ingredients: fake ground beef crumbles, a couple cans of hot chili beans, canned diced tomatoes, onion, and chili powder (bleh!). Now, I like a blend of beans like what you’ve done here, and always chickpeas in the mix. I like what you did with the combo of chipotle peppers and diced green chiles–I’ll have to try that. I did not know that chipotle peppers would keep up to a month in the fridge, great tip. I had taken to pureeing the leftover peppers + sauce and freezing the mixture in an ice cube tray. This has worked out but it’s great having alternatives. I am very excited to eat this on top of a baked potato tonight! This is a nice version of veg chili. I think I will try it, since I am not fan of meat chilis. It’s hard to believe that as a real chili lover, I haven’t made one pot this winter. Somehow I’ve been obsessed with root vegetables this season, however, I think your chili recipe might change this. I’m always looking for new vegetarian chili recipes, especially when someone has taken the time to perfect it, as it can easily become an overly spiced bean stew. I started adding chipotle in adobo to mine, as well. I’ve also made the mistake of adding one two many. I couldn’t taste anything for 2 days! Those little chipotle peppers are hot! They make my nose run, but they’re good! I’ve been thinking about making some vegi chili recently, I can’t stand the stuff in cans, and Scott was asking for some the other day. I’ve got all the ingredients for your version so I’ll let you know how it turns out! As much as I make fun of vegetarian cuisine (I have to, I’m a cow-loving Texan) I always make my way to your blog to see what new creation you’ve dreamed up. I can almost smell this vegetarian chili now, and love that you used chipotles, smoked paprika and fire roasted tomatoes to add flavor. Looks delicious. Can’t wait to try this. I’ve tried lots of vegetarian chilies, and most turn out pretty good, but not that memorable. Looking forward to trying your very own recipe, as it really does look delicious. And I have everything on hand! Miracle. I will probably wimp out and just use the adobo sauce, and not the actual chipotle. The boys still don’t like much spice, but I’m sure it will still add that yummy smoky flavor. Thanks again, it looks like another keeper. Glad you had fun on your trip! I am loving this chili. It is filled with goodness! I’m always on the hunt for a good chili recipe. I’ve got my faves too, but this one looks good. I love the 2 kinds of chili. This one is being bookmarked for sure. I’m going to try this next week. I have my favourite meat chili but I often don’t get very excited about the veg versions. If anyone’s recipe could get me excited it would be yours :) Smoked paprika, chipotle and green chillies – this sounds promising! I really wish I liked chili! I’ll save this recipe to try for when I’m feeling adventurous. I do love that there’s corn in there. And no TVP – I really don’t like that stuff.